An atom is defined as a basic unit of matter consisting of a central nucleus and surrounded by negatively charged electrons. The atomic nucleus contains a mix of positively charged protons and electrically neutral neutrons. The electrons of an atom are bound to the nucleus by an electromagnetic force. An atom containing an equal number of protons and electrons is electrically neutral. Otherwise it is positively or negatively charged and is known as an ion. The hydrogen atom has one proton (+) and one electron (-). Helium has two protons at its nucleus and two electrons. Slightly more complex is the carbon atom which has six protons and six electrons. Uranium has ninety-two protons and the same number of electrons, and it also has one-hundred-and forty-six neutrons to give it its density. The electron, which is a negative charge, is in orbit around the proton which is a positive charge. The negative charge of the electrons neutralise the positive charge of the protons. All other elements, except for hydrogen, contain neutrons as well as protons in their nucleus. Neutrons are almost exactly the same weight as protons but they carry no electrical charge. The neutron’s function in the atom is to give additional mass but call for no additional electrons to neutralise it. Electrons are arranged in tidy orbits around the nucleus, similar to how the planets orbit the Sun in the Solar System. It is the way in which atoms of various elements combine together which give the earth such varied minerals and species. The composition of every substance is made up from atoms. Atoms are the building blocks of the universe. All things in the universe are a replication of each other on a greater or lesser scale, and the light essence of a human behaves similarly to that of the atom; it needs to be still to receive signals from the one mind that governs the universe. The Divine atom is the pairing of spirit & mind. Spirit is the negative charge, mind is the positive charge. 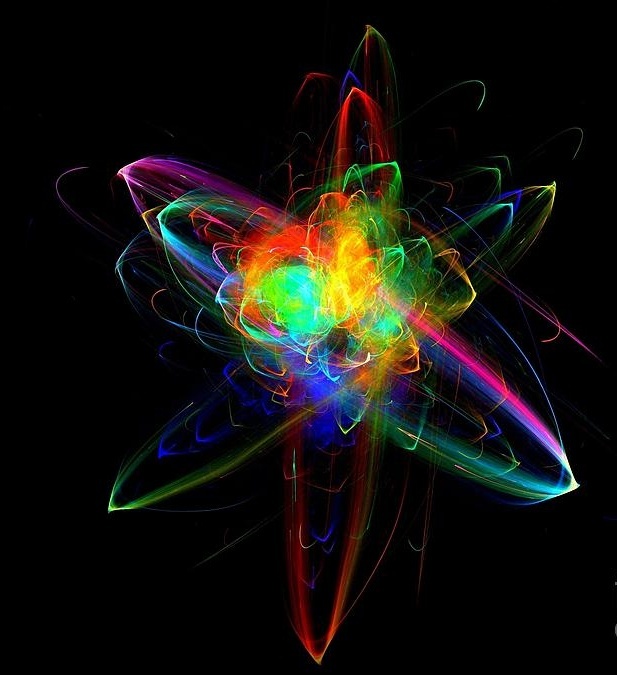 In human beings the soul atom is feminine & masculine energy. Feminine energy is negatively charged and masculine is positively charged. The conscious pairing of masculine and feminine energy reveals the truth behind the universe. A true pairing reveals the Creator of the Universe. This entry was posted in Uncategorized on September 13, 2014 by colletteom.